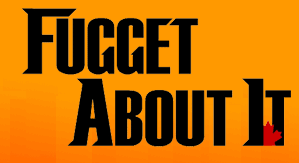 NextGen Player - Canada's Premier Entertainment Blog: “Fugget About It” Premieres Tonight At 10pm on TELETOON! “Fugget About It” Premieres Tonight At 10pm on TELETOON! I recently had the privilege to visit the TELETOON office in downtown Toronto for a sneak peak of two episode from "Fugget About It", an original new comedy series premiering tonight at 10pm on TELETOON At Night. While Jimmy (voiced by Tony Nappo) hilariously brings his big-time gangster mentality to small-town Regina, perhaps even funnier is his assigned witness protection guard -- a Mountie in full uniform, of course. With his do-good attitude and obvious lack of wits, the banter between Jimmy and the Mountie is downright hilarious. Fugget About It is a decidedly mature-audience show, equally as funny as Family Guy, and occasionally as raunchy as South Park. I thoroughly enjoyed the two full episodes I previewed, and definitely recommend it (I won't give any spoilers). Before leaving the TELETOON office they passed me a couple of jars of "Falcone Family" Spicy Marinara which the label says is "good enough to die for". Be sure to check it out "Fugget About It" on Friday nights at 10pm on TELETOON! Who do I have to whack to get a jar of that sauce myself?